Kung Fu was originated from small communities that were forced to protect themselves, their possessions and their livelihoods from rival communities. Disputes instigated by villainous communities attacking the more ethical villages necessitated the creation and development of a system of defence. The initial failure of attackers to take the villagers’ possessions triggered further attacks of revenge upon the defending community. The growing sacrifices of life and possessions that followed, resulted in a continual need to improve and develop the efficiency of the villagers’ defence. It was important though that the ‘good’ remained ethical. The ‘villains’ didn’t know that what they were doing was wrong, or they wouldn’t have done it. 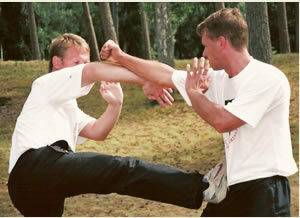 Martial art technique stems from fighting experience and is based on two combatants, using alternate movements. The delivery, the speed, and the power of the movements improve and develop naturally into the most efficient method to stop an opponent. For example, a block and return strike should occur in unison for maximum speed and efficiency. As more movements originate from fighting experience, they are placed together to form a sequence. Each movement is separate and unrelated but in sequence they combine to a form, a kata, an art. Although the movements originate from fighting experience, the art they form is unrelated to reality and is not connected to real fighting. The art is for the purpose of performance, not combat. The style of Wing Chun is based on simplicity. Therefore, it is appreciated world wide, especially for fighting. It is the delivery of the movements that makes a successful fighter, not how many forms one knows. Wing chun is based on the centre line theory applied through close range simultaneous and explosive blocks and strikes. The centre line theory is built on the effectiveness of attacking and guarding the body’s most vulnerable areas (i.e. those areas which cannot be strengthened or conditioned, and where the greatest damage can be inflicted). Such areas for example would include the face and neck, or any areas through the central line of the body where impact, absorption, and damage would be the greatest. The approach of a Wing Chun practitioner is face ‘square on’ to the opponent so that the whole body is aligned and used directly. This necessitates a good body posture with your backbone straight and legs grounded in a strong stance. This maximises the use of the body’s framework in order to generate speed and power. This we call ‘body alignment’ Aligning the body and using it as one unit is fundamental to the style’s effectiveness. The foundations of the framework are built on having a strong ‘bridge hand’ which consists of the shoulder, elbow and wrist; and a strong ‘horse stance’ which consists of the hip, knee and ankle. Delivery of the strike is through the application of ‘triangle theory’ where the angle of the upper to lower arms is aligned for maximum effectiveness of the both the strike and the block, and supported by the power of the whole body behind it. As a close range martial art, blocks and strikes must be fast and accurate. At such a close distances there is no time for the eye to see and mind to respond. As speed is essential, the aim of Wing Chun practice is to help make the student (both their body and mind) become accustomed to the movements so that it becomes their second nature and instantaneous when confronted. Whereas some martial arts are suitable for a point scoring style of championship fighting, Wing Chun is a total, ongoing and continuous process. 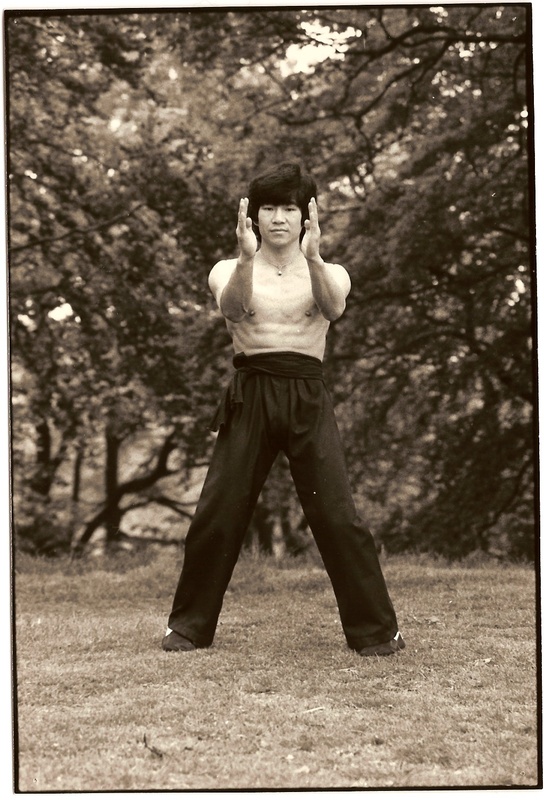 The system of ‘sticking hands’ has been developed to practise the continuous movements of Wing Chun. This unique type of training also emphasises the need to develop and improve one’s reaction and timing to the opponents attempted attack; with the aim of intercepting the opponents movement before it has fully completed. The aim of sticking hands practice is to dominate and control the opponent. This is achieved by forcing the collapse of the opponent’s defence and destabilising their balance. When this is achieved the opponent is unable to offer any resistance. Wing Chun is an art, for which there is no limit, or maximum. The time of your involvement and your success are dependent on you, as a student, not on your teacher. Learning and teaching kung fu can amount to carrying out one programme after another. Students are told that this is suitable for self-defence. Tradition means maintaining and expanding what is valuable. It does not mean passing on the same ineffective method, simply because they have been used in the past. Viewing tradition in this way allows the style to remain distinguished and valuable, as well as enabling it to develop through the years. In practical terms, the purpose of kung fu is to defeat the opponent as quickly and as effectively as possible. In order to achieve the destructive power needed, training must be aggressive and powerful. For this reason, one has to condition the body and mind to combat the fear of violence. In performance terms, the purpose of kung fu is to entertain the audience. One has to train to perfect the techniques and movements, so they are beautiful to watch. Performances often include music and dance. Some excellent kung fu artists still use different musical instruments to inspire rhythm in their movements. 1. Firstly, copying without understanding what you’re doing or why. The conscious mind looks and repeats what it sees. 2. Practising the Wing Chun techniques. You are you. The technique is the technique. You and the technique are separate, without connection. 3. You and Wing Chun technique become one. You are now connected. It is you that is practising. Your mind however remains separate and is not fully present with the movement. 4. At the highest level, movement becomes energy. You are no longer practising the techniques, you are practising the movements. You are using energy to practise the movements, but without thinking. Your heart and mind are with the movements; You are no longer practising Wing Chun technique, you are Wing Chun. The last stage of learning is the highest. Your mind is with nothing but the movements you make. You have reached pure concentration. Each movement is a reaction to that of your opponent. Your mind is not thinking. It is with the energy of your movements. This energy becomes art. Art is a message of intuition, inspiration, and insight, which comes from the soul. Like dancers, musicians, painters, writers, and architects, ideas come from intuition and insight, the mind goes beyond thinking.